“Keep your head down. Keep your head still” are perhaps the most often heard bits of swing advice to recreational golfers from their playing partners. The trouble is, both admonishments are wrong and attempting to keep the head still especially with the chin firmly pressed downward can result in poor ball contact, a loss of distance and control. The “head down” problem is a function of the setup position but easily fixed by correctly addressing the ball with the chin up and the derriere pushed out slightly so your weight is balanced and you’re in an athletic position…think of a shortstop preparing for the crack of the bat. The amount of head movement and in what sequence is difficult to learn even with the help of an instructor but now there is some new technology called the PowerPlane to give you the feedback you need. PowerPlane is simple to use, just attach the hat clip above your left ear (assuming a right handed swing), place the sensor on the clip (it’s magnetic) and set up to a ball with the PowerPlane unit parallel to the line of the shot. If your head is out of position at address or if it goes too far in either direction during the swing the unit beeps. We tested it and it works actually showing two of the testers they were set up too far forward at address meaning they effectively were positioning themselves for a reverse pivot. It also quickly showed there was a lot of movement on the downswing by the single digit handicap tester, sending him back to the pro shop for more range balls. We like that the PowerPlane was equally good if you are having problems with head movement during you putting stroke or when chipping. The sound of the beep is particularly telltale for the lookup before impact either with a putter or wedge. Negatives: Some may feel the price of $189 is a little expensive. 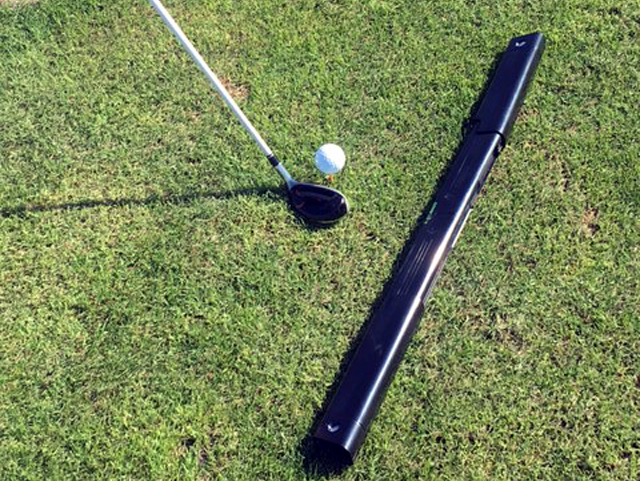 Recommendation: If you have conquered the problems caused by keeping your head down toward your chest and need help for fat and thin shots plus want more distance from better contact the PowerPlane can go a long way to solving the problem. For additional technical information and to purchase visit PowerPlaneGolf.net. Included in the purchase price is free shipping and a PowerPlane hat and there’s a 30-day money back guarantee.